The lawyers of Sumner Law know that major auto accidents can have serious consequences. That's especially true of motorcycle accidents and collisions. That's why our East Bay attorneys take these kinds of crashes so seriously. We work with accident victims, their spouses, and their loved ones to hold negligent drivers accountable for their actions. Below is a list of potential injuries that a motorcyclist may experience as a result of a collision. As you're about to read, these injuries can result in major and tragic changes to a person's life. Road rash is a term used to describe serious abrasions and lacerations associated with motorcycle accidents. When a motorcyclist skids against the ground, this can lead to major cuts and scrapes. This is why it's important for motorcyclists to wear proper attire, such as jackets, jeans, or other sorts of protective gear. Avoid operating a motorcycle when you are not wearing proper protective gear. In a similar vein as road rash, a motorcycle accident can lead to major cuts and bruises on various parts of the body. Again, protective gear and proper attire can help minimize the severity of lacerations and contusions experienced in a motorcycle crash. When a person falls to the ground, they instinctively hold out their hands to break their fall. When riding a motorcycle, the force of a fall can be so great that it lead to serious injuries to the arms. Among these injuries are fractures of the elbow. Sometimes the injuries can affect the entire arm, including issues with the bones, nerves, and other tissues. On top of elbow fractures, it should come as no surprise that a serious motorcycle accident can lead to other types of bone fractures. Broken legs are common in major collisions, as are broken ribs and collarbones. The nature of of the crash will determine the fracture and its severity. 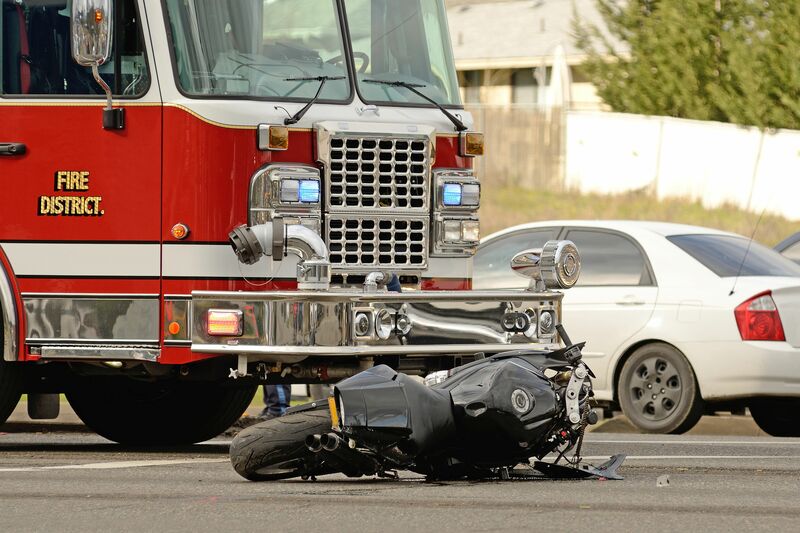 Serious injuries to the head and brain are a major risk when involved in a motorcycle accident. A severe blow to the head can lead to fractures of the jaw and skull, not to mention major facial disfigurement. If the brain is harmed during the accident, this can lead to a concussion, a bran contusion, brain hemorrhaging, and worse. To prevent serious head and facial injuries and avoid traumatic brain injury (TBI), it's of the utmost importance that motorcyclists wear helmets. In the state of California, all motorcyclists and motorcycle passengers are required to wear a helmet. Simply wearing a helmet can save your life, or prevent major harm to your brain that can have tragic long-term repercussions. Given the vulnerability of motorcyclists compared to others on the road, the potential for a major spinal cord injury should come as no surprise. In the worst collisions, it is possible for a motorcyclist to become paralyzed from the waist down (paraplegia) or even paralyzed from the neck down (quadriplegia). Both of these injuries are incurable, and will change your life and the lives of your loved ones. For more information about your legal rights and options, be sure to contact an experienced injury accident attorney today. The lawyers at Sumner Law are here to help you in your time of legal need.